Three Black homelands - Transkei, Bophuthatswana, and Venda - were declared to be "independent states" in 1976, 1977, and 1979, respectively. Since independence their workers had not been regarded as domestic elements of the South African economy. In addition to hearing appeals from other divisions of the Supreme Court, the Appellate Division also acts as the appeal court for the "independent" homelands of Transkei, Bophuthatswana, and Venda. Venda became the third independent homeland on September 13, 1979. 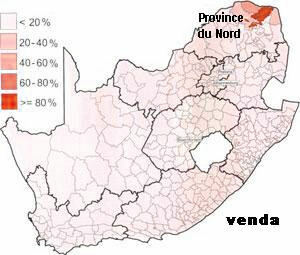 The small territory in the northeastern corner of the Transvaal is more cohesive than other homelands, consisting of two sections (which the Nationalist government has promised to join) and with 68 percent of its official population actually living within its borders. The decision to opt for independence appeared tainted, however, by the tactics of Chief Minister Patrick Mphephu against the opposition party. Although it won a majority of elective seats in both homeland elections, the party was kept from power by detention of twelve of its members and by Mphephu's influence over appointed traditional members of the assembly. By the mid-1970s educated Blacks (here comprising persons with a secondary education or more) were less prone than they had been formerly to deprecate traditional forms. Some, as a gesture stressing their Africanness, were prepared to be sympathetic to traditional practices. Such Blacks, however, dislike the use of these practices if they are perceived as divisive and may derogate groups such as the Venda and Shangaan-Tsonga who seemed to cling to traditional forms because of ethnic parochialism. The Black education system was administered by the Department of Education and Training in Pretoria, which controlled the policies of all Black schools except those that exist in Transkei, Bophuthatswana, and Venda. In the latter three jurisdictions the education systems were administered locally but in coordination with the department in Pretoria, which provided assistance as required. South Africa regarded the small military forces organized in the three Black homelands it recognized as independent in the late 1970s as an integral part of an overall defense system. In 1980 two combat infantry companies cooperated with South African forces in counterinsurgency operations along the border with Botswana. An embryonic homeguard was authorized for Venda in 1979.